What if, instead of measuring our Gross National Product, we measured our Gross National Happiness? It’s not as crazy a concept as you think. In fact, there is one country that has made their Gross National Happiness a priority. 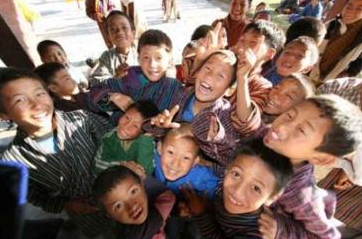 Bhutan has been measuring its Gross National Happiness since 1972. The GNH is based on the philosophy that if the government cannot create happiness for its people, then there is no purpose for government to exist. The GNH of Bhutan is based on four pillars: good governance, sustainable socio-economic development, cultural preservation, and environmental conservation and nine domains to ensure the happiness of its citizens: psychological wellbeing, health, education, time use, cultural diversity and resilience, good governance, community vitality, ecological diversity and resilience, and living standards. A person is considered happy if they have sufficiency in six of the nine domains. The happiest people by occupation in Bhutan include civil servants and monks. Interestingly, the unemployed are happier than corporate employees, housewives, farmers or the national work force. The 2015 GNH survey showed an increase from the 2015 in their overall GNH from 0.743 to 0.756 with 43.4 of the Bhutanese people being deeply or extensively happy, and 91.2% showing sufficiency in at least half of the domains. I’m not sure I’m willing to leave my corporate job to become a monk, but there are many things we can learn from Bhutan’s GNH. First, we need to put a priority on the happiness of people. As a nation, we need to measure how well we are doing at creating the right conditions for our citizens to be happy. And finally, North Americans need to relinquish our obsession with work and material things and go back to the basics. Things like spiritual wellbeing, being physically active and healthy, and developing strong communities. Tomorrow, March 20th is the International Day of Happiness. This week’s #HappyAct is to measure your own GNH. Of the nine domains Bhutan measures, how do you score? Leave a comment.